Melissa Hamilton and Edward Watson in Romeo and Juliet. © Bill Cooper and courtesy of ROH. Melissa Hamilton has been given just one shot at Juliet this season, after only one at Mary Vetsera in Mayerling in 2009. How is an artist to develop a role when she has so little chance to perform it? Since joining the Royal Ballet in 2007, Hamilton has had to strive to prove that she has a wider range than contemporary ballets by Wayne McGregor, Christopher Wheeldon, Michael Corder, and the Balanchine repertoire. Melissa Hamilton and Rupert Pennefather in Mayerling. © John Ross. She’s entered international ballet competitions to show that she can dance ‘the classics’, and was rewarded with a Sugar Plum Fairy (twice) last Christmas. Juliet was her next prize – a three-act leading role with a big narrative arc. She succeeded, overcoming a change of Romeo at short notice: Edward Watson (Leanne Benjamin’s Romeo) in place of injured Rupert Pennefather. Long-legged Hamilton is slightly too tall for Watson, though their lean, hyper-supple physiques are a good match. She has the highly-arched insteps ideally suited for MacMillan’s heroines, who proclaim their sensual natures through the way they introduce themselves on pointe. At her first meeting with Paris, Juliet’s feet carry her away from him; they draw her towards Romeo. In Hamilton’s interpretation of Juliet’s dance with Paris in the ballroom scene, it was clear that he was not going to be the one who aroused her interest. She was still shy, though enjoying being the centre of attention. She was intrigued and then impressed by Watson’s Romeo in his solo to her mandolin playing. But she wasn’t yet swept off her feet by the stirrings of first love in her initial pas de deux with him – largely because she was concentrating on the lifts with an unfamiliar partner. 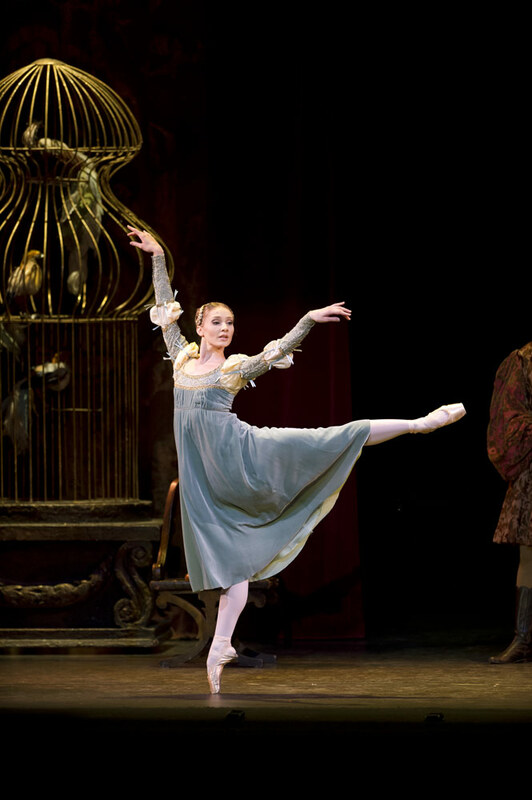 Melissa Hamilton as Juliet. © Bill Cooper and courtesy of ROH. The the stillnesses started to tell. The two of them stood dumbstruck in the midst of Verona high society, unable to deal with conventional niceties. They were wonderstruck at what was happening to them in the balcony pas de deux. Hamilton’s Juliet wasn’t making the running, too cautious to be headstrong by diving into Watson’s arms. But the awkwardness in partnering was forgiveable because these were two lovers who didn’t know each other’s bodies. Their long concluding kiss was a promise of passion and a pact with death. They were at last in tune with each other in the bedroom pas de deux, both despairing at his departure. Hamilton came into her own as an actress in her cumulative rage at her parents’ lack of understanding; her resentment at being forced to be Paris’s puppet was compelling. She’d changed from a helpless child to an inwardly defiant young woman who knew she had a way out of a forced marriage – the potion hidden in her bedclothes. Though taking it terrified her, she was more resolute than many Juliets. Melissa Hamilton, with Xander Parish, at the 2011 National Dance Awards where she was nominated for an Outstanding Female Performance award. © Dave Morgan. Her bravery could have been more convincingly compromised when Juliet wakes in the family vault. Georgiadis’s set, with the huge, looming angels restored, is a horrifying sight. Hamilton barely registered it before finding Romeo’s body, grabbing a dagger and killing herself. Juliet needs to reclaim the ballet in these final moments, since Romeo’s grief at her seeming death has seized all our sympathy. When (we trust) Hamilton has another chance at the role, she can dwell on the chilling details of Juliet’s discoveries, instead of rushing in relief to her end. Watson’s Romeo was at his best in scenes of desperation: killing Tybalt, leaving Juliet, finding her lifeless. He’s not one for outbursts of joy exploding in high-leaping choreography, expressing his ardour instead through elegant arabesques and well-controlled pirouettes. While he was attractively responsive to everyone Romeo encounters on stage, his intensity with Hamilton’s Juliet helped make her debut a memorable one. A very fair review. I thought the only blemish on Melissa’s perfomance was Juliet’s waking in the vault which as noted did lack conviction.Other than that considering this was her debut in the role and she had to cope with a late change of partner (even if it was the admirable Ed Watson) I thought Melissa gave a fine performance.